Here you find information about the values of coins including values of US coins and other countries like German and European coins. Author: George S. Cuhaj with current values. In this book you find the values of all German coins since the year 1501! Every serious collector of German coins needs this book. Prices are rising sharply for U.S. coins, and the collectors need to keep up on present values with the most respected resource for updated pricing, North American Coins & Prices. This extensive reference offers collectors complete listings and prices for all U.S. coins, as well as listings and prices for Canadian and Mexican issues. Coin collectors can always spot a good deal, so it's no wonder the three-in-one North American Coins & Prices is a top choice. Not limited by boundaries, more fellow collectors are expanding their collecting efforts beyond geographic definitions. With 45,000+ listings for the earliest of coins to the most modern from the U.S., Canada and Mexico, this book helps you define or refine your collecting interest. With updated values in up to 11 conditions and more than 3,000 illustrations, this new edition provides you with three complete references for the price of one. More than 1,000,000 up-to-date prices on world coins of the twentieth century (1901 - 2000). about 50,000 clear photos for simple identification and grading assistance. You get the values of all official coins of the whole world which were published 1801-1900. You get the values of all official coins of the whole world which were published 1701-1800. You get the values of all official coins of the whole world which were published 1601-1700. Are you one of the 125 million coin collectors in the United States? 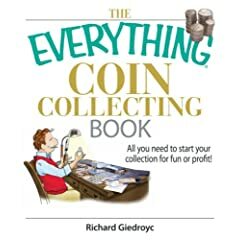 Whether you're a beginner or an avid collector, The Everything Coin Collecting Book is your accessible reference for this exciting and profitable hobby. Written by a well-known numismatic authority, this is only authoritative guide written in an approachable style for every reader. Covering it all-from starting a collection, to selling and trading like a pro-this is the all-in-one guide you need to maintain a successful collection and trade for profit. Standard Catalog Of World Gold Coins: Platinum and Palladium issues included (Standard Catalog of World Gold Coins) With over 1,200 pages, this hardcover volume covers gold coins, date-by-date, from the 1500s to present, including palladium, platinum and off-metal sister issues. Complete date/mint listings, actual weights, current values in five grades of condition, along with crisp obverse and reverse photos help make this extraordinary volume the most desired coin reference available. A Guide Book of Peace Dollars is the 13th entry in Whitman's Bowers Series of numismatic references. It covers every date and mintmark of America's last 90% silver dollar, which began as a commemorative of peace after the tribulations of World War One. The book also studies the mysterious 1964-D Peace Dollar, as well as proofs, patterns, trial pieces, errors and misstrikes, countermarks, die varieties, and famous collections. Full Color, Softcover, 288 Pages, Fully Indexed. Are you looking for more books about coins?